The key goal of the International Research Training Group (IRTG) The Brain in Action – BrainAct is to deepen our understanding of the neural systems and processes that underlie perception and action in everyday living. German and Canadian partners with longstanding and internationally renowned expertise in systems neuroscience will join forces to combine top-level interdisciplinary research with state-of-the-art training of doctoral candidates. „Circuit models of form processing in primate V4“ (Karl Gegenfurtner, in cooperation with: Wyeth Bair und Anitha Pasupathy, University of Washington) aims to discover the computations and neural circuitry underlying the remarkable capacity of the primate visual system to recognize innumerable objects regardless of their position, size, view and clutter. „Towards a Neural Theory of 3D Shape Perception“ (Roland Fleming, in cooperation with: Steven Zucker, Yale University). The long-term goal of the project is to develop a computational model in neural terms to explain how 3D shape is estimated in the primate visual system. The PRISM network researches how the brain represents the richly detailed visual ‘look and feel’ of surfaces and objects in our everyday surroundings. The aim is to shed light on how we perceive the 3D shapes, material properties and illumination in the scenes we encounter as we move through the world. In order to do this, a combination of behavioural techniques, neurophysiology, brain imaging and computational modelling is used. The project "Mesopic Vision" is being supported by the German Research Foundation from November 2010 until October 2011 with € 200.000. The project is a sub-project of "New Mesopic Image-resolving Photometrics with Analysis Software and Measuring Camera" in Cooperation with Darmstadt Technical University (Prof. Khanh) and Tübingen University (Prof. Kurtenbach). To date the characterization of visual signal processing under mesopic illumination circumstances has not satisfactorily succeeded. The project deals with mesopic movement perception, as previous research has already shown that under low illumination, subjects systematically underestimate their own speed. With a view to the relevance of those findings for road traffic, we investigate the effects of different central and peripheral illumination conditions on the perception of motion. The German Research Foundation supports the project "Wahrnehmung von Materialeigenschaften" (english: perception of material properties) with € 1.25 million for a period of five years. The DFG´s Reinhardt-Koselleck-Programm is reserved for particularly innovative but also risky project ideas by excellent individual scientists. The research group "Perception and Action" is being supported by the German Research Foundation. The first funding period was 2004-2007. The current second funding period began in January of 2008. The research group aims to understand the relation between visual and motor processing. Further projects and descriptions can be found on the website of the research group. The research training network "NeuroAct" is being supported by the German Research Foundation. The network was started in 2003 and renewed in 2007. It takes place in the universities of Marburg and Giessen, laboratories from the fields of Psychology, Neurophysics, Human Movement Science and Linguistics are integrated. The network tries to answer the question of how sensory stimuli are being processed and - after being modulated through processes of memory, learning, attention, emotion and language - how they are used to control behavior. DThe Marie-Curie Network "Coordination for optimal decisions in dynamic environments" (CODDE) brings together leading scientist from all of Europe to understand the cerebral processes that allow us to perceive and act in a dynamic environment. Das CODDE Network does research on the link between sensory input, brain activities and motor output. In doing so, behavioral techniques, brain imaging, movement measuring and computational modelling are being combined. The network is composed of 8 university partners and 4 industrial partners. The network trains young scientists and does innovative research. This happens through collaboration and cooperation between the partners. We periodically meet, offer student exchanges and organize advanced training classes. Communicative cultural techniques such as reading and writing are the basis of every complex society. The research focus "Kulturtechniken und ihre Medialisierung" (english: cultural techniques and their medialization" has been requested in the framework of the competition proceeding "LOEWE ─ Landes-Offensive zur Entwicklung Wissenschaftlich-ökonomischer Exzellenz". It addresses the change of cultural techniques, its effects on "cultural products" and the constant adaption of their socio-cultural handling. This is supposed to be investigated from the perspective of medialization. Approaches from linguistics, cultural studies, sociology and science of history are being combined. The project "Gaze-based Communication" (GazeCom) is supported by the European Commission within the Information Society Technologies (IST) priority of the 6th Framework Programme. Our objectives are to (i) show that gaze guidance has a high impact on what is perceived and communicated effectively; (ii) advance the level of understanding of the human visual system to the point where gaze guidance becomes feasible, and (iii) build prototype systems that exploit these insights and demonstrate the potential for applications. If these objectives can be reached, we believe the resulting technology will fundamentally change the way in which information can be communicated in the future information society. The European Summer School exposes young vision researchers—at the late pre-doctoral or early post-doctoral level—to the principal methods and seminal issues of contemporary visual neuroscience. In addition, it seeks to build a basic fluency in the emerging lingua franca of computational neuroscience. The range of topics is broad, literally from spikes to awareness, and the pace correspondingly brisk. This intensive experience should allow participants take a broader view of, and make more informed decisions about, their future research direction. The European Summer School is taught by leading researchers in neurobiology, neuropsychology, psychophysics, and theoretical neuroscience. Two thematically related topics are covered each day, with approximately 3 hours allotted to each (including discussion time). An after-dinner discussion provides an opportunity to contrast and compare the day’s lectures. In addition, students pursue computational and theoretical projects (based on Matlab) during the afternoon, to experiment with key concepts and techniques of computational neuroscience. The DFG project "Cortical mechanisms of color vision" (2001-2009): The objective of the work presented here is to investigate the cortical processing of color information. Which color-specific mechanisms process the signals coming from the retina in order to get to a precise and stable representation of color in the visual cortex? Research is done on to what extent this information is then provided for the processing of other perceptional tasks, like the computation of shape and movement. Thus, color is not to be looked at as detached from other image attributes here. We rather try to explain how those attributes are being integrated in order to get to a consistent representation of our natural environvent. DFG project "Perception of natural scenes" (2002-2006): The objective of the work presented here is to investigate the visual processing of natural scene pictures. Almost anything we know about cerebral processing of visual stimuli in humans has its source in psychophysical and neurophysiological research that only used very simple stimuli, such as sinus grids, points of light, or line segments. But ultimately it has become apparent that even under those reduced stimulus conditions, non-linear processing mechanisms often dominate the behavior of the visual system as a whole. Thus, we aim to find out to what extent our knowledge about the early stages of visual processing is of use when it comes to the perception of natural images. Specifically, using a number of experimental variations of a categorization task (animal/non-animal images), we will try to find out which image attributes are used by the human visual system to solve this task. 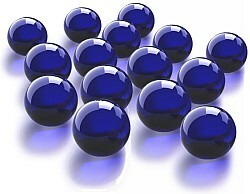 These image attributes are then being compared to those attributes which arestatistically optimal for solving the task. 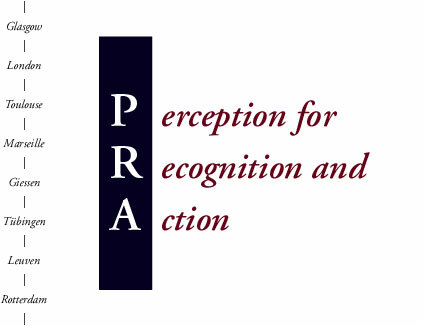 Perception for Recognition and Action (PRA) is a research training network that was funded by the European Commission from 2003 to 2006. The network is composed of 8 research groups and it contains more than 20 scientists, 10 of which were specifically appointed for the network. Our aim is to achieve a better understanding of the cerebral mechanisms underlying perception and action and the link between them. ModKog was funded by the german Federal Ministry of Education and Research from 2002 to 2005. The project is based on interdisciplinary research in the field of visual attention and it has possible applications in the areas of medical diagnostics and visual communication. Within ModKog, we closely collaborate with the Institut für Neuro- und Bioinformatik der Universität Lübeck and SensoMotorik Instruments in Berlin. ModKog´s objectives are summarized at Itap.